It doesn’t happen with any great frequency but there are occasions when right from the first listen you know an album and indeed an artist is something very special. Such was the case with this, ‘I Draw Slow’s’ third album release, ‘White Wave Chapel.’ On this tremendous recording the listener will be treated to some of the most beguilingly beautiful female vocals around but what makes the voice of Louise Holden stand out is that there is also great emotional depth, something that helps set this hugely talented Irish quintet apart from the crowd. Lifting them even further is their ability to amalgamate their own Irish folk music heritage with old timey American folk music creating a hugely appealing sound. 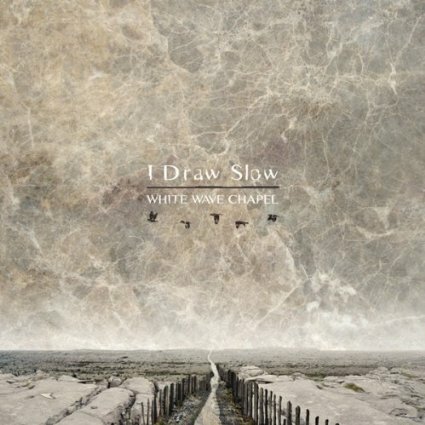 I Draw Slow is an Irish band consisting of Dave Holden on guitars and vocals, Colin Derham, banjo, Dave’s sister Louise Holden on vocals, Konrad Liddy plays upright bass and Adrian Hart on fiddle. All of the songs were written by Louis and Dave Holden with the exception of Don’t You Cry My Honey which is traditional and the album was produced by I Draw Slow and Brian Masterson. They have created an edgy atmosphere so redolent of the harshness of much of the traditional folk music and the hard lives that people lived back in the days from whence, stylistically as well as atmospherically, their music comes. The depth of feeling and submergence in their unique creations is only trumped by the sheer beauty of the vocals and melodies. I have absolutely no doubt that even at this early stage ‘White wave chapel’ will be in many best of year lists thanks to the gorgeous sounds and the sense of drama attached to every song; and that is before you consider the quality of the writing, arrangements and the sheer skill and musicality exhibited by all. As far as I’m concerned the album was off to a flier as soon as I heard Louise Holdens beautifully feminine, atmospheric vocals. As one of the writers, along with brother Dave, she knows the requirements of every song and all of the little nuances, but it is a fact that many singer/songwriters fail to deliver despite that intimacy with the song. Louis doesn’t fail; she is the possessor of a stunningly beautiful voice that is also loaded with character and has the ability to project a fiery edge where necessary. Their songs always have an edgy impact lyrically which with the beauty of the vocals, melodies and playing lifts the album way above their peers. The album opens with All Souls, a quite stunningly beautiful song, with gorgeous lead and harmony vocals driven by fiddle and banjo, the quality enhanced by the contrast between the beautiful melodicism and the hard hitting lyrics. This is followed by Don’t She Run, with another stunningly beautiful vocal and heart rending harmonies with banjo and fiddle plus bass on a song that has a lovely easy rolling tempo despite the edginess of the lyrics that contrast perfectly, actually enhancing the beauty. The Captain is a dramatic mid tempo seafaring tale driven by fiddle and banjo with another tremendous lead vocal from Louise with David harmonizing perfectly and yet despite the dark lyrics there is an uplifting feel to the song thanks to their mid tempo attack. The only ‘trad song is Don’t You Cry My Honey, and this bands tremendous version could easily have been taken from a 1920s hoedown in a lost Appalachian ‘holler’ such is the drive and power. The vocals create an atmosphere but the dynamic playing serves to increase the power by several notches. Final mention goes to the extraordinary Hide And Seek. Maybe it’s the watery references but every time I play this dramatic song I’m reminded of Millais’ ‘Ophelia,’ (which may well say more about me than the song) with a similar haunting otherworldly beauty to the song as with the painting. There is a lovely flowing fiddle and banjo accompaniment plus the usual gorgeous lead and harmony vocals on a tale that meanders, albeit in an epic way! The songwriting, arrangements and playing are all dynamic and of exceptional quality but even this excellence finds it difficult to match Louise’s beautiful open, expressive vocals, the sibling harmonies and the sheer beauty of the melodies. Certainly, the mix of generic folk styles contained on this disc has been done before but rarely this good and to my knowledge, never better!